(BPT) – The start of the school year means a laundry list of to-do’s for parents. From shopping for school supplies to scheduling an annual physical, it’s a hectic yet exciting time for the entire family. As kids settle back into the groove of the school year, you can ensure they are prepared with the right pencils and notebooks, but if they are straining to see the teacher, learning will be a challenge. While carrots have a reputation as an eye-healthy food, there are many other options that keep kids seeing sharp. These five superfoods will help keep your kids’ eyes healthy so they can better focus at school. Bulk up on berries to maintain that perfect vision. Blueberries, blackberries and strawberries are packed with eye-healthy vitamin C. Bonus: because vitamin C is an antioxidant that boosts the immune system, it will help stave off the coughs and colds that often come along with the start of school. When kids crave crunch, seeds and nuts are the perfect choice. English walnuts, raw almonds, flax seed and sunflower seeds are satisfying on top of yogurt or in a homemade trail mix. Plus, these nuts and seeds contain omega-3 fatty acids, which research shows can help support vision. This breakfast staple can boost eye health, but keep in mind not all eggs are created equal. Eggland’s Best eggs come from hens fed a wholesome, all-vegetarian diet that results in a superior egg packed with eye-healthy nutrients such as 38 percent more lutein, three times more vitamin B 12 and five times more vitamin D than ordinary eggs. Antioxidants in kale, spinach and broccoli help keep eyes healthy and prevent disease. Each vegetable contains high levels of lutein and zeaxanthin, which studies have found lowers the risk of advanced macular degeneration and cataracts. Oranges make awesome snacks or meal add-ons. Because citrus fruits are loaded with vitamin C, you’re not only giving your child a naturally sweet treat, you’re helping support eye health. Plus, the smell of citrus will awaken the senses to help fight the afternoon slump. 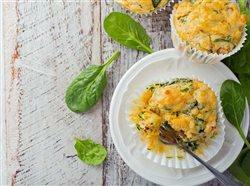 Want a tasty recipe kids will love that incorporates multiple eye-healthy superfoods? Get into the back-to-school spirit and try these Green Eggs and Ham Cups for breakfast or lunch. For more recipe ideas, Lakatos recommends visiting www.egglandsbest.com. Sauté onions and broccoli over medium heat until soft. Add spinach, ham and continue cooking until spinach is wilted. In a mixing bowl, whisk together eggs and seasonings. Add vegetable and ham mixture to eggs. Coat 12 muffin cups with nonstick cooking spray and fill each muffin cup with egg/veggie mixture. Bake 15-17 minutes or until eggs spring back or toothpick comes out clean. Cool on a rack and remove from pan. Enjoy warm or room temperature. *Egg cups can be rewarmed in the microwave or toaster oven if desired.